I first encountered her through her music at a concert in Houston, Texas many years ago, but I still remember the event to this day. The space was nearly dark as a group of singers entered with brightly lit candles. They began to sing songs unlike anything I had heard before: monophonic melodies which just soared and soared. After a while, a strange instrument joined their voices. It looked like a fiddle with a crank and sounded like a bagpipe. Later I learned that it is called a hurdy-gurdy. The singers belonged to the British Group ‘Sinfonye’ and were joined that night by members of the Oxford Girls Choir. They sang songs composed by Hildegard of Bingen. The experience was so enthralling that it launched me on a journey of discovery. Of course, I had heard about Hildegard of Bingen before. I knew that she had lived in the middle ages in Germany, not too far from my hometown. But now that I had heard her astounding music, I wanted to know more. Who was the woman behind this music? 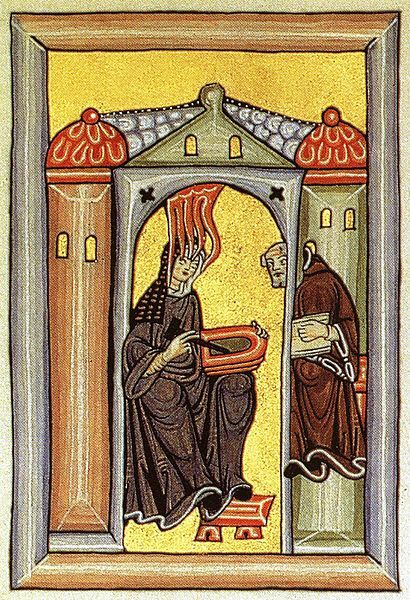 Hildegard of Bingen lived from 1098-1179 in Southern Germany. She was born into a noble family. When she was very young, her family dedicated her to the church and she was raised in a convent. There she received an education in writing and prayer. At the age of 38 she be came an abbess – the leader of a community of religious women. She was a writer, a poet, a composer, a painter, and a healer – as well as a livelong sufferer of migraine headaches. Everything interested her: animals, plants, herbs, stars, colors, sounds, philosophies. As a child she had visions, but she kept them secret for many years. Finally she felt compelled to offer an account of her visions in a book called “Scivias” (Know the Ways). The book also includes beautiful illustrations (called illuminations) which are compelling in their own way. Hildegard of Bingen also composed encyclopedias of natural science and medicine as well as works on spirituality and ethics. She carried on an extensive correspondence across Europe and was not afraid to speak her mind. She wrote beautiful liturgies which are still performed today. The church remembers Hildegard of Bingen on September 17, the day of her death. What insights might Hildegard of Bingen have to offer to our own times? Perhaps it was her ability to see the love of God in all things. The universe is filled with God’s love, she said, from the lowest depth to the highest star, everything is filled with love. This is a powerful message and helpful reminder for us who live in 21st century and who are often so anxious about economic and ecological troubles, and so worried about terror attacks. Hildegard’s world was no more peaceful than our own, but she was able to see God’s love in everything. Perhaps this ability to see God’s love in everything is something we could learn from her.